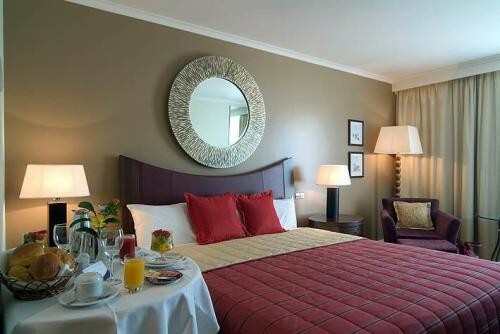 A modern room 5 Star hotel located close to the Gulbenkian Foundation in Lisbon. Largest congress hotel centre in the capital with full facilities and equipment. Discount for online reservations. The Corinthia Hotel Lisboa is a newish five-star addition to the hotel accommodation in the capital of Lisbon, offering luxurious surroundings and friendly hospitable service. It is located in the Avenida Columbano Bordalo Pinheiro which lies approximately halfway between the Airport and downtown Lisboa, and within easy walking distance of the Gulbenkian Foundation and its Museums. 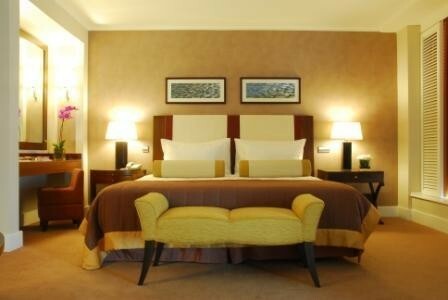 There are 518 rooms which include normal rooms, executive, superior and suites. This hotel is also a popular location for meetings and congresses. The hotel has 17 fully equipped meeting rooms and can cater for a total of 1.400 delegates - this making it the largest congress hotel facilities in Lisbon. It has recently inaugarated the MaloSpa to increase the range of its facilities. There is a choice between two restaurants, the Sete Colinas for gourmet dinning, and the Restaurant Tipico which maintains a traditional Portuguese cuisine with some international favourites. There is the comfortable Tempus Lounge Bar in which to relax or to meet clients. Guests will find the hotel provides a professional high level of service so that their any needs may be answered. There also is a well equipped Business Centre and a secured parking facility. A satellite TV and views over the city feature in this elegant room. This room benefits from air conditioning, a private bathroom, satellite television, tea and coffee making facilities and a mini bar. A king-size bed and floor-to-ceiling windows feature in this elegant and spacious room. This room type includes: - 2 interconnecting rooms - 2 separate bathrooms. - Satellite TV with children's channels. - Buffet breakfast for the entire family. With views over Lisbon, this room has air conditioning, satellite and cable TV. It also comes with a work desk.